Towering over the city centre of Nottingham is a magnificent 17th-century mansion, built on a sandstone outcrop (Castle Rock) on the site of the original medieval castle erected by William the Conqueror in 1067. The castle building now houses the city's finest art collection, and a small museum charting the history of the Sherwood Foresters Regiment. The art galleries include interactive displays and the artworks are presented in a vibrant, interesting way. The well-kept grounds of the castle are used for a full calendar of events, from historic pageants to an outdoor theatre season. 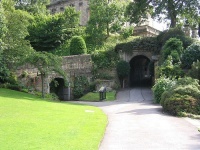 There are also fascinating cave tours, a medieval-style children's playground and a picnic area, as well as a rather famous statue of Robin Hood himself.